The book of the week was How to Find Hidden Real Estate Bargains by Robert Irwin. I am a big fan of real estate, so it is not surprising that this book caught my eye. And up to this point every book that I have read about real estate has had me captivated, I cannot say that this book fell into that category. This book does have fantastic information about real estate, without a doubt. However, it is written like a textbook. It didn't get me excited, in fact, it was almost like pulling teeth to read it all in one week. It is the same format for each chapter... very cookie cutter. So that being said, it's a good thing you came here because now you get some of the gems of information without the dryness. A real estate bargain is any way to buy property for less than market value. 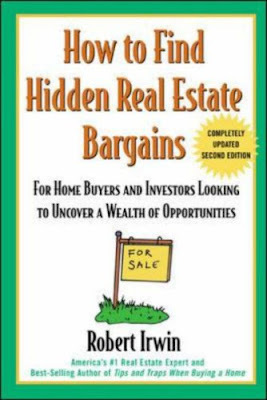 This book explains the process on the heavy hitters: REO, Foreclosure, HUD, VA, Fannie and Freddie REOs, GSA and IRS Auctions, SBA, Treasury, and Army Corps. Lots of information! In looking for real estate bargains within any of these categories you need to consider 7 areas: Price, Terms, Rental and Resale Market, Location, Condition, Zoning, and Occupancy. Generally, you shouldn't buy a property until you have a good understanding of each of these categories. 1. Price- Is the property selling below market value? Check out the county records, most are online, and see what surrounding properties sold for recently. 2. Terms- Will you still make money off the property after you consider the following: Down Payment? Interest Rate? Is your financing matching the market? Are you doing any risky financing that will get you in trouble 5 or 7 years down the road? 3. Rental and Resale Market- How will you match up in these areas when the time comes? What are the local rental rates? Is real estate sales historically slowing? 4. Location- Is the location better than the seller realizes? Is is worse than you think? 5. Condition- This is the biggest category with bargain properties! Is it a distressed property that you can fix up or will you be spending beyond your bargain savings paying a contractor to fix it up? Do you know how it got to be distressed? How long will it take to make the property livable again? 6. Zoning- What possibilities does the property have for the future? Is it zoned for 3 units and there are only two on it currently? 7. Occupancy- Is the property vacant? Is is fully occupied? What are the terms of the current leases? Will you have grounds for evicting a problem tenant with the way the lease is written? Seems simple enough, right? If this is your first time buying a property I encourage you to work with an agent. Do some interviews and find the best. They can teach you a ton! Plus it doesn't really cost you any money. Their paycheck comes from a percentage of the sale. And you won't be buying the property unless the price is right anyway. There isn't a lot more that I want to expand on with this book. Work with an agent and they will show you what is out there and help you find a bargain. Do your due diligence on the property and buy it if all the criteria stacks up. As always, if you have any questions on the book don't hesitate to ask. I would be more than happy to help anyone that wants it. OFHEO has reaffirmed that both GSEs remain adequately capitalize­d. At the same time, recent developmen­ts convinced policymake­rs and the GSEs that steps are needed to respond to market concerns and increase confidence by providing assurances of access to liquidity and capital on a temporary basis if necessary.­"